Contact Olde Town Roofing for all your roofing requirements. Olde Town Roofing is a CertainTeed SELECT ShingleMaster™ Certified Roofing Contractor. Olde Town Roofing is a certified SELECT ShingleMaster from CertainTeed and can install designer shingles with extended warranty coverage. CertainTeed's Integrity Roof System ensures a comprehensive roof for your property. As a certified SELECT ShingleMaster™, Olde Town Roofing are able to install quality products by abiding to the program's code of ethics and installation guidelines. CertainTeed offers range of building exterior and interior products for residential and commercial projects. 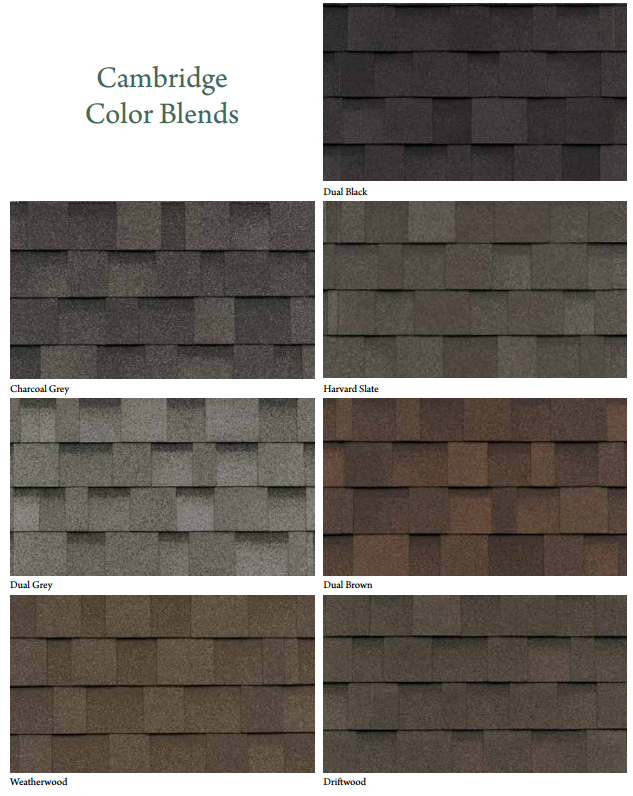 Landmark: Landmark shingles are available in variety of colors and have algae resistance for streak free roofs. They have Class A fire resistance and solar reflective capabilities that are favorable for all roofs. NorthGate: NorthGate designer shingles have Class 4 impact resistance that protects the roof from hail and wind damage. The shingles resist cracking even in extreme cold temperatures. 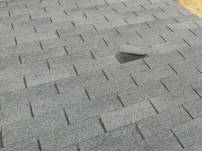 Home owners can get additional discounts on their home insurance for installing the NorthGate shingles. Flintlastic: The Flintlastic roofs are suitable for flat roof areas on your property such as garages, car port, canopies, porches, and so on. 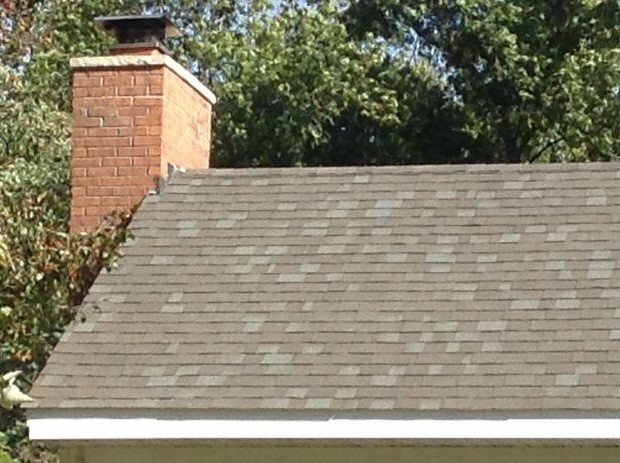 You can match the color of your roof shingles with the flat roofs for a uniform look. All commercial roofs can be installed with Flintlastic series for building protection. 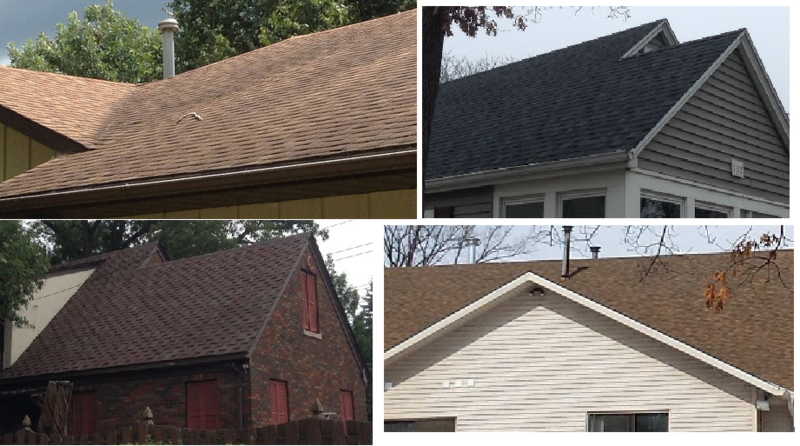 Call Olde Town Roofing at 309-738-5550 for the combinations available in your area. 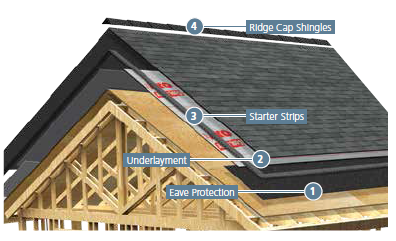 CertainTeed's Integrity Roof System comprises of compatible underlayment, starter shingles, roof shingles, hip and ridge caps, and roof ventilation. The NailTrak system guides the nailing for faster installation. The filtered rolled ridge vent and intake vent from CertainTeed faciliate airflow and ventilation in the attic. The shingles are having extra coatings to resist algae growth with the StreakFighter protection. The WinterGuard waterproofing underlayment helps prevent ice dams during winter. Here is an overview of the Integrity Roof System. All CertainTeed shingles installed with Integrity Roof System and by a certified ShingleMaster such as Olde Town Roofing have enhanced protection. 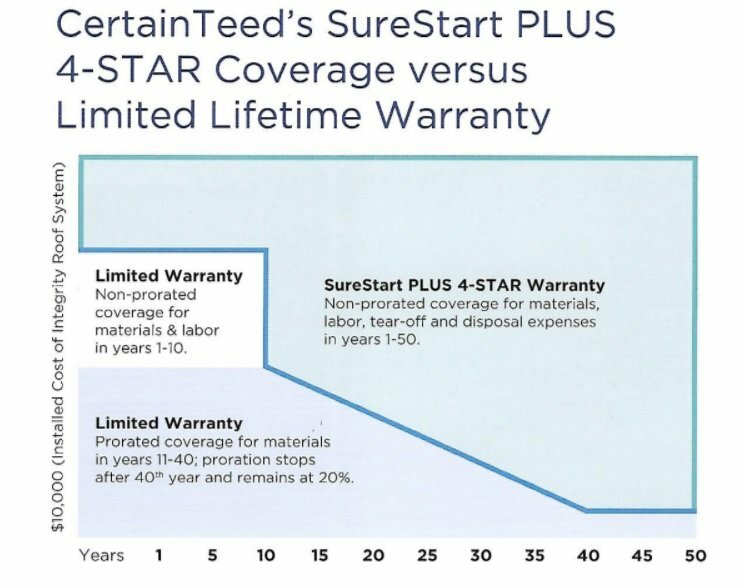 The SureStart PLUS 4-STAR coverage is a non-prorated coverage for materials, labor, tear-off, and disposal upto fifty years. Certain installations are applicable for high-wind warranties up to 130 mph. 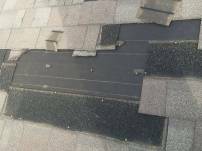 Flintlastic flat roofs are also eligible for warranty when installed as per the requirements. 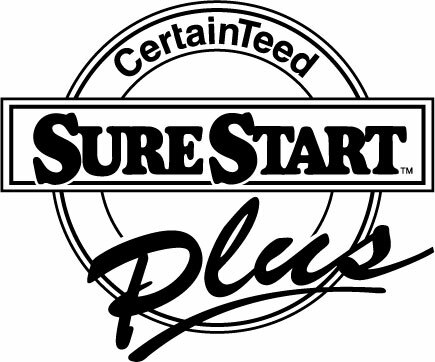 CertainTeed's warranties are fully transferrable in case of change in ownership. Here is a demonstration of CertainTeed Warranty. Here are some online tools available from CertainTeed to visualize your product. ColorView: Select a home design exterior options and digitally experience the actual home. The tool has an option to enter your zipcode and contact details so certified contractors can contact you. ColorCoach: Understand the basics of color matching and color combinations for exteriors such as roofing, siding, trim, stone, garage, and so on. Trim-it: Select different trim options and view how they enhance the exterior appeal. Blend-it: Select different shades of Cedar on a model house and look how it appears. CertainTeed has ongoing promotions for those who serve the US Military. Special discounts exist for recycling the old shingles and so on. IKO Dynasty™ with ArmourZone battles the elements and protects your roof against inclement weather. IKO Dynasty™ shingles are engineered to be the most wind-resistant for winds up to 130 mph. Here is a local picture where Olde Town Roofing installed IKO Dynasty™ Appalachian shingles. IKO offers range of roof types including Dynasty™, ArmourShake, Royal Estate, Cambridge, among other architectural shingles. Design your roof type in the IKO's interactive shingle selector tool ROOFViewer™. Here are some roofs which Olde Town Roofing built locally. IKO shingles are available in different color blends. The Cambridge architectural shingles create a high-end designer look for your home at an affordable cost. Huge array of colors are available to suit your needs whether rustic, urban, traditional, or modern. Check with Olde Town Roofing if the color is available in your area. Here is a sample of Cambridge Color Blends. 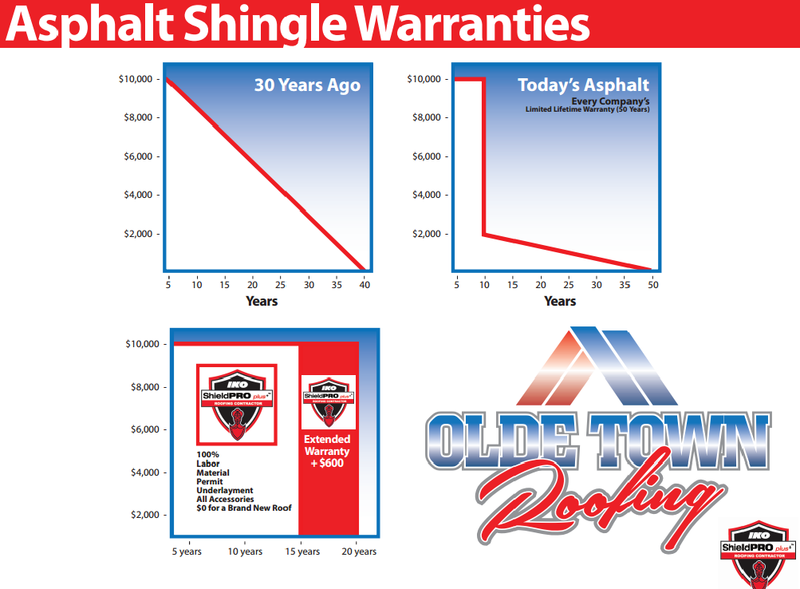 Asphalt Shingle Warranties were depreciating with time 30 years ago. Today's Asphalt warranties from most companies cover 100% up to 10 years and depreciating up to 50 years. However, IKO Warranties offer 100% coverage for the first 15 years and you can extend the warranty to another five years for $600 more. The warranty will cover 100% labor, material, permit, underlayment, and all accessories. Ask Olde Town Roofing for the special IKO Warranty options. IB Roof Systems is the leading manufacturer of PVC roofs for residential and commercial roofing. For low slope roofs, IB Roof Systems can result in weather proof roofs with appropriate water drainage and insulation. The application of PVC membranes are relatively simple and result in energy efficient buildings. IB Roof System is mainly PVC membranes and compatible products for low slope roofing. 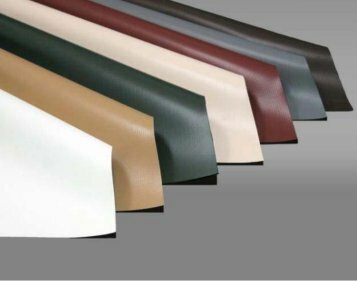 The Poly-Vinyl Chloride (PVC) material used in the IB Roof System offers robust alternative to traditional commercial roofing material. IB Roof Systems offer robust products and guidelines to the installers. Technical guidance is available to install the PVC roofs. The products are cleared for safe building and Energy Star rated roofing. The property owner is able to realize the benefits of long lasting roof and energy efficiency of the property. The energy savings results are significant for commercial properties. IB-PVC roofs are increasingly preferable to traditional Ethylene Propylene Diene Monomer (EPDM) synthetic rubber or Thermoplastic Polyolefin (TPO) roofs. PVC roofs are also selected over hot tar applied built up roofing. The IB white roof material has high solar reflectivity coatings and the roofs stay cool even at high temperatures in the atmoshphere resulting in overall reduced temperature to the property. For example, black roofs rise up to 175 ℉ at surface temperature of just 85 ℉. Whereas the PVC roofs' temperature remains at about 91 ℉. PVC roofs are also suitable for the MidWest weather and the large commercial units in the region. The material is made using environmentally safe methods and can be recycled to reduce wastage. The main approach of the IB Roof Systems is to select certified quality contractors such as Olde Town Roofing to install their quality material. Call Sean at 309-738-5550 for your next roofing project to install IB Roof Systems. Here is an overview of the mechanically attached IB Roof System. IB Roof System products installed by Olde Town Roofing are available in 50 mil, 60 mil, or 80 mil thick membranes. The roll sizes can be customized based on the property. White, cool sand, tan, brown, red, green, and gray are the current color membranes available from IB Roof. Other products offered include insulation, cover board, metal termination board, flashings, drain, vents, adhesives, sealants, primers, seperation sheets, fire sheets, vapor barriers, fasteners, and plates. The compatible products from IB Roof result in a long lasting roofing system. Call Olde Town Roofing at 309-738-5550 for the custom combinations for your project. A certified installer such as Olde Town Roofing is mandatory for IB Roof System warranties to be effective. Limited Lifetime warranties are available on residential and commercial products. Warranty from IB Roof is the strongest aspect of buying their products. IB Roof offers 30 years of labor and material for commercial PVC roofs. For residential roofing, they offer the warranty for lifetime as long as the owner occupies it. Special credits are available for installing IB Roofing system from the home insurance companies such as State Farm. Call Olde Town Roofing at 309-738-5550 for the manufacturer warranty and additional guarantee offered. Schools with no airconditioning can be ten percent cooler by installing IB Roofs. Restaurants and food processing units can benefit as the PVC membranes are resistant to extreme heat, smoke, oil vapors, grease, and other chemicals. Old churches can maintain the original green or copper colors as the PVC membranes are available in different colors. Large commercial roofs can be installed with safe working conditions and quality. Expansion of living spaces to roof deck is possible by adding green roofs and landscaping. Material is safe to install other systems such as solar and air conditioning. Here is an overview of green roofing possible by IB Roof products and Olde Town Roofing installations. Call Olde Town Roofing at 309-738-5550 for a detailed plan of your next roofing project. IB Roof System is beneficial for both customers and contractors. Quality and cost-effective roofing is possible with IB Roofing System products and Olde Town Roofing installations. Call Olde Town Roofing at 309-738-5550 for more information about IB Roof advantages for your property. 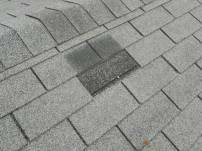 Here are the conditions in which you may need to replace your roof. If your roof has any of these warning signs, call Olde Town Roofing for a roofing inspection. Olde Town Roofing will do a full inspection and let you know if you need to replace your roof or not. We will also recommend the best type of roof to get, based on your structure and its environment. With the complexity of some roofs, these days it can be hard to complete an accurate inspection. That's why Olde Town Roofing started doing drone roof inspections if required. This way we can get the best view and get the most accurate diagnosis of your roof. Please note that drones can not be used in heavily wooded areas. 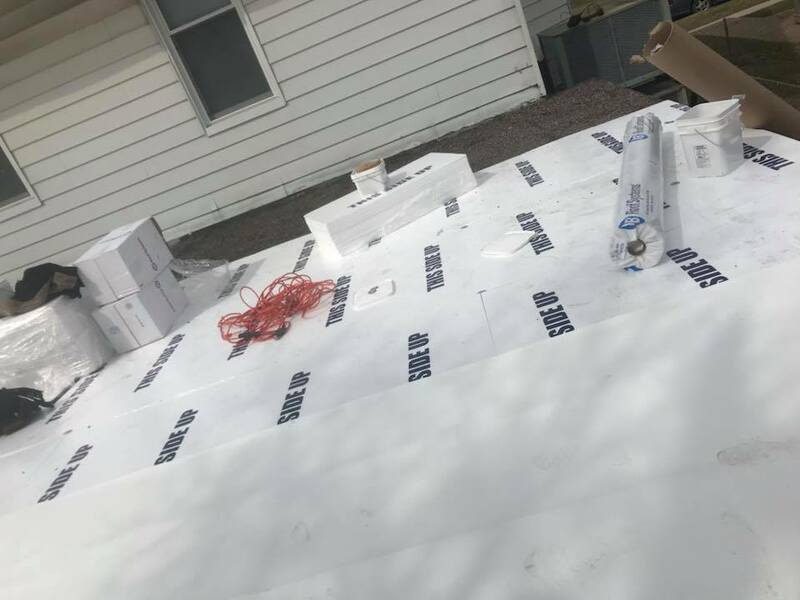 If our inspection reveals that the current roof deck can be saved by saving the current system Olde Town Roofing will recommend using a Conklin based Cool Roofing solution for your roof. 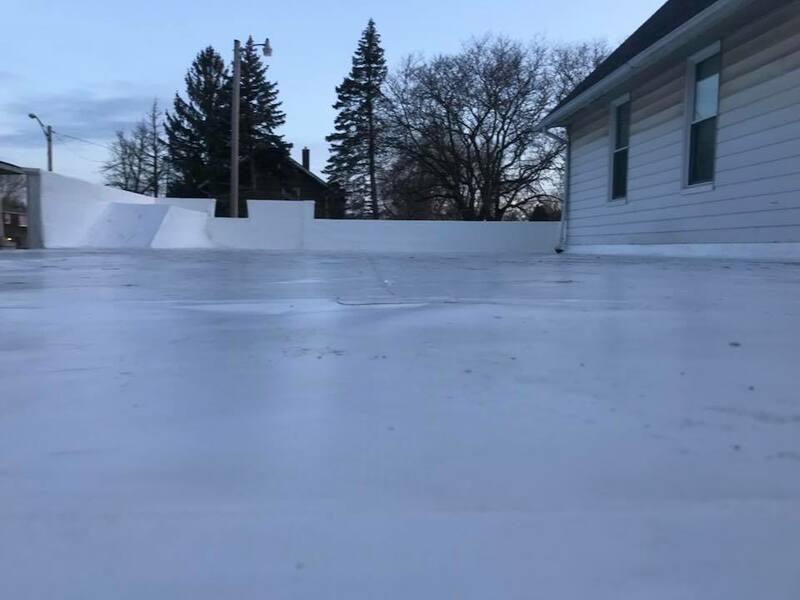 This is an Energy Star rated elastomer roofing system that uses the current roof and applies a new fully warranted Energy Saving White roofing coating. This will provide a warranty with the same lifespan as replacing the current roof deck, but will save thousands of dollars over full replacement. If a full replacement is necessary, Olde Town Roofing will use the best new products available from manufacturers such as Mule Hide, Firestone, and IKO. We will install your new roof the right way at a price lower than the competition! Our installers have over 20 years of experience installing the best new roof for your business! 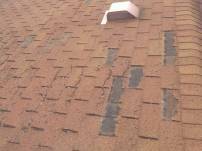 Here is a short glimpse of Olde Town Roofing inspection.